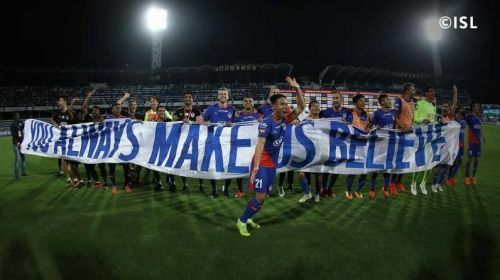 Bengaluru FC players celebrating after the playoff game against NorthEast United. It's finally showtime for the big dance at the Hero Indian Super League (ISL) 2018-19 after 6 months of exciting football. A season with ups and downs and a lot more to talk about comes to an end with Bengaluru FC locking horns with FC Goa. Unarguably the two best teams of the competition will play the final at a neutral venue - Mumbai Football Arena, on Sunday evening. Bengaluru FC has reached the ISL final for a second consecutive year, deservingly. The team never lacked in terms of attack or effective combinations. From Rahul Bheke in defence to Udanta Singh in the attack, BFC had a bunch of players to rule the field. Even after the injury to striker Miku and Sunil Chhetri’s dull form in between, Bengaluru managed to rule the ISL points table. The semi-final results are just a glimpse of what this team can achieve at Mumbai. Going into the second leg with a goal trailing, BFC never looked on the weak foot and smashed 3 goals NorthEast United to march into the finals with a 4-2 aggregate win. If Carles Cuadrat can make his boys do what they do the best, the ISL cup could well reach India's Garden City on Monday. FC Goa was a predictable finalist even before the start of the season. The new season got off well under Sergio Lobera. The excellent run of Ferran Corominas continued along with eye-grabbing performances from Edu Bedia, Jackichand Singh and Seriton Fernandes. The Gaurs scored the most number of goals by any team in the league stage (36). Goa’s defensive compactness has been their biggest success this season, conceding only 20 goals. The semi-finals was a story completely narrated by the Goan players. The first leg saw Mumbai City being thrashed at their home 5-1. Even a defeat in the second leg (1-0) didn’t do them much harm. A good moment of attack from Goa is all that is required for the club to clinch their first-ever ISL cup. Bengaluru FC is not expected to alter their winning combination against NorthEast United. The only area of concern would be the defense without Albert Serran which allows Cuadrat to play an extra foreigner in attack. FC Goa had the right combinations on the field during both of their playoff matches. However, Brandon Fernandes had to be taken off during the second leg match against Mumbai City, due to an injury. If Fernandes is not fit to play, Manvir Singh might get a call in the first XI. Bengaluru FC will have Sunil Chhetri as the target man. The skipper played a crucial part in the second leg, where he glorified the victory with the 3rd goal. Above goals, Chhetri can play the role of an ‘on-field mentor’ in the final. The 34-year old has 9 goals and 3 assists this season and can take away the pressure with his vast experience. FC Goa will undoubtedly play Ferran Corominas as their key player. The golden boot award winner for the second consecutive time will be a serious threat for BFC. Coro currently has 16 goals and 7 assists to his name this season including the one against NorthEast in the first leg. Apart from scoring, Coro is handy at creating chances too, which can take Goa closer to the cup. The Hunt for the New Champion is only 90 minutes away, or maybe 120, or maybe more, if we go into a penalty shootout. The two table toppers making the final will only intensify the excitement. Bengalur and Goa, both deserved a spot in the final and there's very little to separate them.